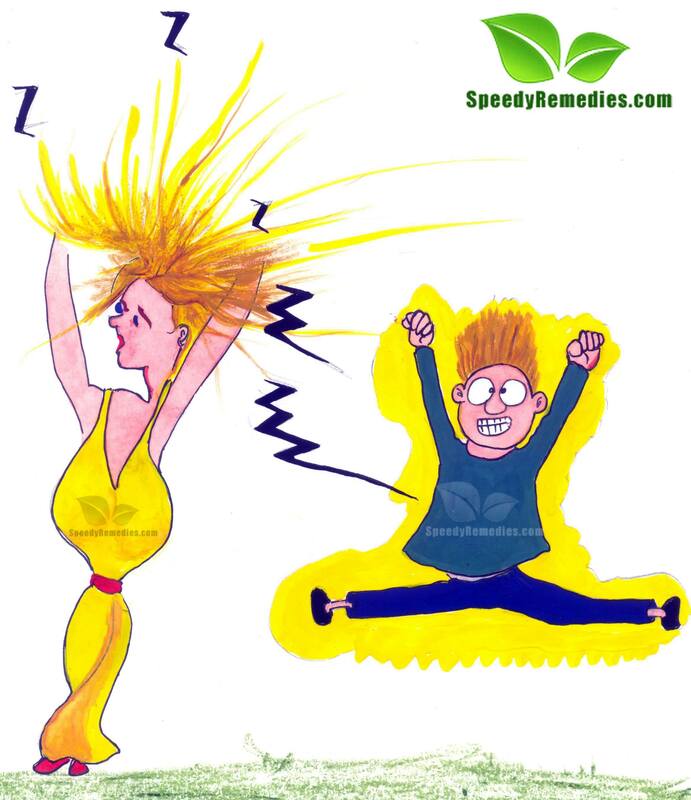 You are here: Home / How To Get Rid Of.. / How To Get Rid Of Static Cling In Hair? How To Get Rid Of Static Cling In Hair? Static cling is an extremely annoying problem that is caused by static electricity, which in turn arises due to friction. If you are eager to find out how to get rid of static cling in hair then here’s some help. The most important tip in this regard is to add moisture to your hair. The reason why this remedy works is that static hair results from dry air. No wonder this problem is so common during winter season. Lightly rubbing dryer sheets on hair is the most widely used and easiest remedy for getting rid of static cling in hair. So, you can stack some of these sheets in your bag as a quick fix for flyaway hair.Watch this video to understand how to use dryer sheets to get rid of staticky hair. Spraying a solution of fabric softener and water is also beneficial in reducing static cling. For this, you need to dilute a tablespoon of liquid fabric softener in a spray bottle filled with water. Simply spaying water (just enough to eliminate dryness) is useful in removing hair static considerably. Application of a body or hand lotion can help smoothen static hair. To follow this natural cure, just pour some lotion in your palms, rub them together and then run your fingers through your hair. Rinsing your tresses with vinegar serves as a valuable home treatment for frizzy hair. Besides, vinegar rinse is beneficial in getting rid of scalp residue. Use it as a last rinse after washing your hair. Prepare the solution by adding half a tablespoon of vinegar in a cup of water. Mildly coating your lustrous locks with silicone-based hair gel, mousse or serum can prove effective in keeping your flyaway strands down by neutralizing electrical charges. Another useful tip to get rid of static cling is to put some hair spray on a boar brush and then run it through your hair. Make sure the brush has a wooden handle and natural fiber bristles (not plastic or synthetic). Run a humidifier to replenish moisture in the air. Avoid blow drying; if you cannot do without a hair dryer then opt for an ionic hair dryer. Switch to a rich, moisturizing shampoo and leave-in conditioner. Stay away from hair styling products that have high alcohol content. Opt for cotton or cashmere caps rather than the ones prepared from acrylics, polyester or wool. However, if you insist on wearing a knit cap, it is suggested to wear a satin or silk scarf underneath the cap.In case you are a fan of faux fur hats then just rub the inside of the hat with a dryer sheet before wearing. Avoid wearing rubber-soled shoes; instead for leather shoes as they help reduce static electricity. Having hair problems? We just have the right oilutson for you! 101 Hair Loss Products answers all your problems regarding hair loss. First and foremost, it is 100% natural, made from herbal ingredients. Plus, it has been developed by Dr. Zhao,an acclaimed dermatologist. What makes this product even great is that it delivers and meets your expectations and it is easy on the pocket!